The cave paintings of Ajanta are the oldest to survive in India. 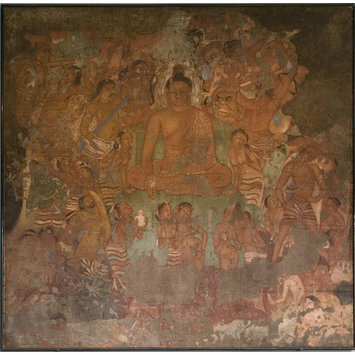 They depict scenes from the lives of the Buddha and date from the 1st century BC to about AD 480. The cave complex was discovered in 1819 and later Captain Robert Gill made copies of the paintings. Unfortunately, most of the copies were destroyed by fire, so in 1872 John Griffiths, the principle of the Bombay School of Art, began painting new ones. He and his Indian students made approximately 300 paintings, of which this is one. 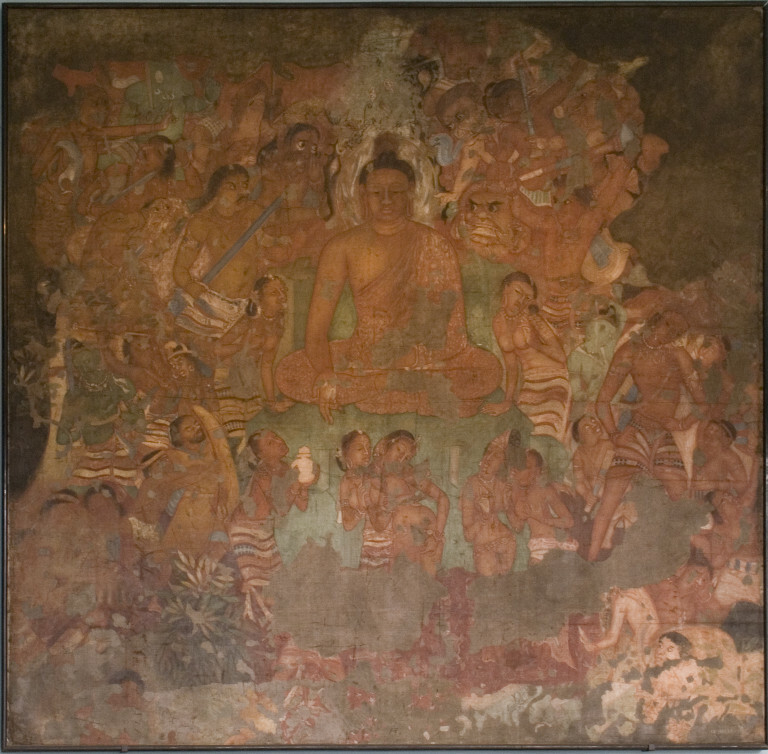 This painting depicts a Bodhisatva in a forest setting. This painting is of a bodhisattva in a beautiful forest /mountainous setting. In the top left hand corner there are charm bearers, identified as such by the sword he is carrying which represents their magic knowledge. In the bottom left hand corner you have a royal entourage, local king and queens taking offerings of flowers. The figure on the right hand side has been the source of many theories. - Identified as the personification of a Vajra – a vajra is a five pronged sceptre which represents the combination of wisdom and compassion. When a bodhisattva is depicted as holding a vajra, they are called vajrapani and are seen to embody the power of all the Buddhas. right is a figure who may be the Bodhisattva Vajrapani. immense power of the Buddha nature.